FREE AIRPORT TRANSFER to the hotel is being offered with every direct booking of a MINIMUM of 5 NIGHTS done through the hotel website www.portoazzurro.com.mt. Book your stay directly online via the Porto Azzurro official website. Offer is only valid for bookings with a minimum of 5 nights or more. 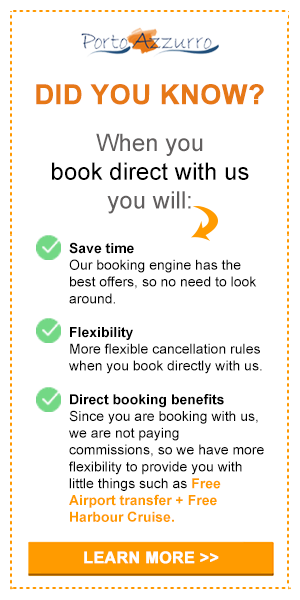 Offer is not valid with promo codes or any other accommodation offers. Please forward your Flight details & Arrival Time to our Reservations Team on: info@portoazzurro.com.mt by not later than 7 days before your arrival. Should this information is not submitted on time, you will not be entitled to the Free Airport Transfer to the hotel.